Some individuals with troubled skin try the topical antibiotic Neosporin for pimples as an over-the-counter remedy. While a variety of results have been reported, the overall consensus is that Neosporin, while great for healing, should be used sparingly as an acne treatment. The active ingredients in Neosporin are bacitracin, neomycin and polymixin-B, as well as zinc. These ingredients are antibiotics designed to kill bacteria on the skin. Neosporin is specifically mixed to prevent infection in minor scrapes, cuts and burns. It can also speed up the healing process and prevent scarring. As such, people with acne have used Neosporin on pimples. A dab of Neosporin gently rubbed into the zit may help improve its appearance. However, you may not experience any results, or the acne may become worse. There is no consensus about the sort of skin, or type of acne, that responds well to this treatment. There is one main use for Neosporin that some acne sufferers rave about: spot treatment. You can find positive comments and reviews by those who have used the product on message boards at sites such as Acne.org. Both the Allure article, "So, You Popped That Zit. Now What?" along with the Leaf article, "Can Neosporin Help Heal Acne Scars?" list Neosporin as an effective spot treatment. For example, when a pimple is freshly popped, light applications of Neosporin may help heal it quickly and prevent acne scars. You should not squeeze a pimple, but when one opens on its own, a quick dab of Neosporin can help improve the skin's appearance. If used twice a day for a few days (no more than a week), and only on the affected area, it may help heal the skin. Despite the positive results some experience, there are some potential problems with using Neosporin on acne that consumers should consider. Neosporin's base is petroleum jelly. This is great for a wound, because a fresh injury must be kept moist during the healing process. Despite the antibiotics, some users reported that the product clogs pores on the face. This is part of the reason Neosporin made Newsweek's list of "The Four Worst Home Acne Cures." The article also claims that it does not deal with bacteria that causes acne. So, not only is the breakout not being treated, but the thick ointment blocks pores, making acne worse. Using Neosporin for pimples long-term can cause a serious problem. If used for more than a week, Neosporin will start to break down the natural elements in your skin that help resist certain bacteria. 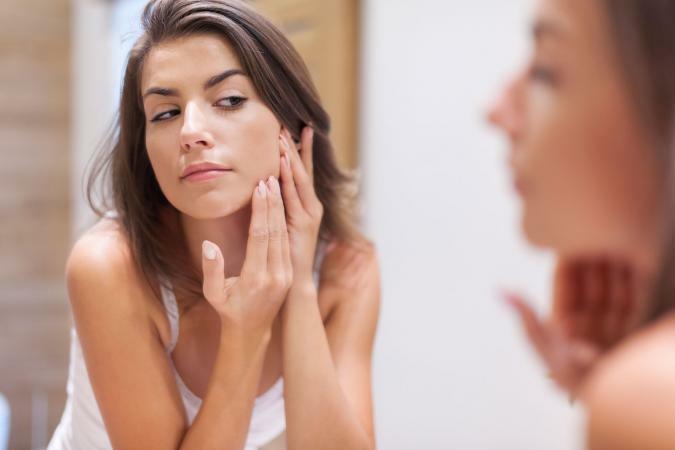 According to the article, "Should You Use Neosporin to Treat Acne? ", the active ingredients in Neosporin (Polymyxin B Sulfate, Bacitracin Zinc, and Neomycin) do not work for acne. They can cause the skin to become resistant to antibiotics and lead to contact dermatitis. The warning on Neosporin advises that it not be used on large areas of the body. If you spot treat a zit with Neosporin and see good results, it may be tempting to carry on using it, but it is best to use either prescription, over-the-counter, or home remedies specifically designed for acne. A report from Centers for Disease Control and Prevention, "Antibiotic Resistance Threats In The United States," highlighted the rising issue of antibiotic resistant germs. Propionibacterium acnes (acne-causing bacteria) have become more resistant to topical antibiotics. That resistance makes certain treatment methods less effective over time, which has caused many doctors to treat problematic skin without the use of antibiotics. While Neosporin can be used as a treatment for staph or strep bacteria that cause acne, it does not remove or treat bacterial acne. The website Facing Acne claims the product cannot reach into pores to kill bacteria that may live there. Since it cannot penetrate the pores or treat underlying bacteria, Neosporin is not considered an effective treatment method. However, it can add moisture to dried areas surrounding a blemish and minimize pimples with clear yellow pus, as they are often caused by staph bacteria. 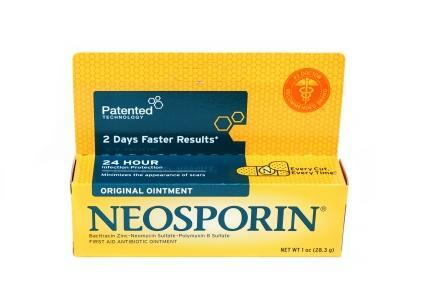 Neosporin Original Ointment: The original (and name-brand) version is doctor recommended for burns and scars and has 24 hour protection against infection. Add it to your medicine cabinet for around $7 per tube. Neosporin + First Aid Antibiotic/Pain Relieving Cream: Used to prevent infection and provide temporary relief of pain or discomfort in minor cuts, scrapes, and burns. The cost is about $6 a tube and can be applied one to three times per day. Neosporin + Pain Relief Neo To Go! : This next product is specially designed to be carried in your purse or pocket. It can be used on the go whenever you need it most. At about $8 per spray, this is a little more expensive, but is a convenient option. 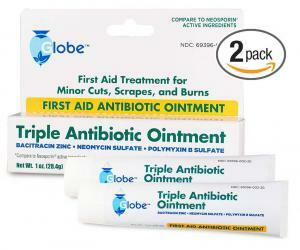 Triple Antibiotic First Aid Ointment: Looking for a generic formulation of Neosporin? The Globe Brand ointment is designed to give long-lasting infection protection and minimize the appearance of scars. Costing about $8 for a 2-pack of topical cream, this is an inexpensive product to consider. Although there is not conclusive evidence of whether Neosporin helps acne, the product is not commonly recommended. Health professionals typically suggest products that are specifically formulated to treat acne. The Mayo Clinic has several suggestions for acne treatments but does not include Neosporin as an over-the-counter remedy. Instead, it is suggested that products with ingredients such as benzoyl peroxide or salicylic acid be used. Although some users have reported brand-name Neosporin as an effective acne product, it should be used with caution. It is not a product designed for acne. Individuals who are not responding to over-the-counter or home remedies for acne should contact a dermatologist to help treat their skin.